The Germany Defense Ministry will decide whether to purchase the Medium Extended Air Defense System (MEADS), a replacement for the US-developed Patriot, by late June, a ministry spokesperson said on 15 May 2015. The German Sueddeutsche Zeitung newspaper reported that the ministry had already decided to purchase the MEADS systems, manufactured by US technology company Lockheed Martin in cooperation with German and Italian producers. “Representatives of the ministry are currently discussing this, including with manufacturers. A decision will be made by the end of the second quarter”. The value of the potential agreement is estimated to be 4 billion euro ($4.5 billion), making it one of the most costly purchases made by the German Defense Ministry in recent years. The MEADS deal, if sealed, would replace current Patriot equipment, which was developed in the 1980s. The ministry’s decision on the missile defense system is widely tipped to become one of the key steps of the current German government. The NATO-managed MEADS project was launched in the mid-1990s to replace the Patriot system in the United States and Germany, and the Nike Hercules system in Italy. However, in 2011, the Pentagon acknowledged that the program had failed to meet “schedule and cost targets” and refused to purchase the system for the US Army. Germany also stated in 2011 that it would not buy MEADS in the foreseeable future, having already invested around 1 billion euro in the project. MEADS is a transatlantic cooperative effort between the United States, Germany, and Italy to develop an air and missile defense system that is tactically mobile and transportable. It will be capable of countering tactical ballistic missiles and air-breathing threats, including cruise missiles. MEADS will improve the limited area defense of vital assets, both civilian and military, as well as provide capability to move with and protect the maneuver forces. MEADS will provide coalition forces with a system capability that is currently not available: a weapon system that can be deployed where it is needed with the versatility to provide force and asset protection during all phases of military operations. It will be employed either in combination with other systems as part of an integrated air defense, or individually in stand-alone operations. The Medium Extended Air Defense System (MEADS), formerly the Corps SAM [Corps Surface-to-Air Missile] program, is the only Theater Missile Defense (TMD) system under consideration to provide maneuver forces with 360 degree defense protection against the real and growing threat of short-range tactical ballistic missiles, cruise missiles, and unmanned aerial vehicles. This system is intended to provide fundamental enhancements in tactical mobility, strategic deployability, and operational capability. Key in this regard will be transportability on C-130 aircraft as a highly mobile system designed to protect forward deployed and maneuvering forces. MEADS would replace Hawk, and some portion of Patriot. MEADS will provide joint and coalition forces, critical asset and defended area protection against multiple and simultaneous attacks by short to medium range ballistic missiles, cruise missiles, unmanned aerial vehicles (UAVs) and tactical air-to-surface missiles (TASMs). MEADS will have a netted and distributed architecture with modular components to increase survivability and flexibility of employment in a number of operational configurations. In addition, MEADS will provide significant improvements in strategic deployability, transportability, mobility and maneuverability. Its substantially reduced lift requirements enable MEADS to be deployed rapidly with essential combat loads via inter/intra-theater land, sea, and airlift anywhere in the world. MEADS will provide Combatant Commanders with an Air Missile Defense (AMD) system that is fully transportable by C-130 aircraft, thus increasing strategic and tactical mobility. Further, its decreased size/weight and ability to conduct rapid march order and system emplacement will enhance maneuverability, thereby providing better AMD protection to maneuvering forces. MEADS is a future Force system. It is an international co-development program essential to fulfill the requirements of the US Army and the US Marine Corps for a low-medium air and missile defense system in the 21st century. MEADS will offer a significant improvement in surveillance, target tracking, integrated fire control and target engagement, tactical mobility and strategic deployability over comparable missile systems. It will defend the maneuver force and other critical forward-deployed assets against short and medium range Theater Ballistic Missiles (TBMs), cruise missiles (CMs) and other air-breathing threats such as unmanned combat aerial vehicles (UCAVs) throughout all phases of tactical operations. 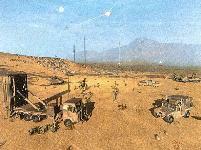 MEADS will operate with upper-tier systems in areas of debarkation and assemble and provide continuous coverage alone, or with Shorter Range Air Defense Systems (SHORAD) systems such as SLAMRAAM in the maneuver areas of the battlefield during movement to contact and decisive operations. MEADS will be interoperable with other airborne and ground-based sensors and utilize a netted and distributed architecture with modularly-configurable battle elements to provide a robust, 360-degree defense against short and medium range TBMs, CMs, UAVs, tactical air-to-surface missiles, rotary-wing and fixed-wing threats. A critical void remains in maneuver force defense against the current and future Air and Missile Defense (AMD) threat of short and medium range TBMs, CMs, and low-to-medium altitude advanced air-breathing threats. This program will meet this challenge by integrating the PAC-3 missile and developing the critical technologies required for maneuver force protection, including development and testing of a Light Weight Launcher, Reloader, 360-degree Multifunction Fire Control and Surveillance Radars and a netted and distributed Battle Management/Command, Control, Communications, Computers, and Intelligence (BM/C4I) Tactical Operations Center (TOC). The objective MEADS Fire Unit, which will be scalable and tailorable to operational requirements, will consist of: two Battle Management Command, Control, Communication, Computers and Intelligence (BMC4I) tactical operations center (TOC), enabling distributed system operations and Beyond-Line-of-Site (BLOS) engagements for maximum protection of supported forces by engaging at longer ranges; six near-vertical launchers capable of transporting and launching up to eight missiles; three launcher reloaders; the MSE missile; an ultra-high frequency (UHF) Surveillance Radar (SR) that provides 360-degree coverage and near-range to long-range detection of low radar cross-section targets; and two X-band Multifunction Fire Control Radars (MFCR) that provide 360-degree coverage and are designed for high-precision handover to the in-flight missile, discrimination capabilities, and short-range target detection and horizon search. The program fell apart when the U.S. Army preferred to buy an upgraded version of the Patriot missile instead of pursuing MEADS development. This left the Italians and Germans with the only feasible option of buying the U.S. made system. Adding salt to the wound, the U.S. insisted on security inspections of European-fielded Patriot systems to ensure U.S. technology was not being exploited. This obviously upset the European partners, both on account of economics, and as a matter of trust and cooperation. The PAC-3 Missile Segment Enhancement (MSE) missile has been accepted as the baseline missile for MEADS. It is being developed by the U.S. for PATRIOT to meet U.S. operational requirements. MSE will provide a more agile and lethal interceptor that increases the engagement envelope/defended area of PATRIOT and the MEADS systems. The PAC-3 MSE improves upon the current PAC-3 missile capability with a higher performance solid rocket motor, modified lethality enhancer, more responsive control surfaces, upgraded guidance software, and insensitive munitions improvements. With the approval of the Defense Acquisition Executive, the Army has combined the management, development and fielding of the Patriot and MEADS programs. The Patriot/MEADS CAP is an integral element in the DoD Ballistic Missile Defense System (BMDS) and is based on the concept that the MEADS objective capability will be achieved through an evolutionary approach by incrementally inserting MEADS major end items into the current Patriot system, thereby providing increased capability to the field in a timelier manner. This approach allows for earlier modernization and fielding of enhanced capabilities to current Patriot forces in conjunction with recapitalization efforts. PAC-3 provides a remote-launch capability, which significantly extends the defended area; increases range, altitude, and firepower with the PAC-3, hit-to-kill, missile and ground support equipment; and engages multiple TBM, cruise missile and UAV threats. PAC-3 system upgrades are planned to counter evolving threats, improve joint interoperability, and increase surveillance and detection capabilities required as part of evolutionary development. While the PAC-3 CRI missile is the baseline missile for MEADS, the MSE missile is being developed to meet U.S. operational requirements. MSE will provide a more agile and lethal interceptor that increases the engagement envelope/defended area of the Patriot system and MEADS. MSE improves the current PAC-3 missile capability with a higher performance solid rocket motor, modified lethality enhancer, more responsive control surfaces, upgraded guidance software, and insensitive munitions improvements. The change to the missile will be incorporated into production planned for FY10. Sensor and battle management software technology from both US and international programs will be examined to enhance and augment organic-equipment functions, reducing development cost, manpower requirements and risk. Improvements will be balanced against costs and the projected threat to develop a US and allied capability to counter the current and future AMD threats. The approach emphasizes prototyping of system-specific and surrogate hardware in key areas of BM/C4I, fire control radar, and Light Weight Launcher to satisfy mobility, strategic deployability and interoperability requirements. The typical MEADS battery uses three radars: a UHF surveillance radar and two X-band multifunction fire control radars. The fire control radar is C-130 transportable, and provides 360-degree coverage against all targets in the MEADS threat set. It performs target acquisition, track, and classification, discrimination and identification functions, and also provides a tactical, in-flight data link to the PAC-3 missile, which has been chosen as the interceptor for the MEADS system. The fire control radars can operate in a rotating 360-degree mode or a staring (sectored) mode, and the two in a battery can operate in tandem in a coordinated, complementary rotating mode for added battlefield flexibility. The radar uses an active antenna array, with more than 10,000 solid-state transmitting elements. As of mid-2007 two of the six critical technologies - launcher electronics and Patriot Advanced Capability (PAC)-3 missile integration - were mature. Three other critical technologies - the low noise exciter that manages the radars' frequencies, the cooling system for the radars, and a slip ring that carries power and coolants to the radars-are nearing maturity. The remaining critical technology - the transmit/receive module that transmits/receives signals for the fire control radar-is immature. The project office estimated that the maturity level of the low noise exciter, the radar cooling system, and the slip ring will remain unchanged when product development begins and that the transmit receive module will be near full maturity. The office expects all critical technologies to be fully mature by the start of production in late 2012. There are no backup technologies for any of the MEADS critical technologies. Medium Extended Air Defense System (MEADS) is a tri-national co-development program among the United States, Germany, and Italy to replace the U.S. PATRIOT air defense systems, PATRIOT and HAWK systems in Germany, and NIKE Hercules systems in Italy. Within the PATRIOT/MEADS CAP there are two synergistic efforts: an international MEADS development effort managed by NAMEADSMA, and a U.S. effort to inject U.S.-specific capability requirements into the MEADS Major End Items (MEIs). The Army revised the MEADS acquisition strategy to combine management, development, and fielding of both the MEADS and PATRIOT systems. The combined aggregate program will provide for the evolution of the Patriot/PAC-3 system to the MEADS objective system through the early introduction of the MEADS Major End Items (MEI). This approach provides for earlier fielding of enhanced air and missile defense capabilities across the currently fielded force to counter the evolving threat and allow for the knowledge that was gained in the development and fielding of the Patriot System to be fused into the MEADS program. A multinational joint venture headquartered in Orlando, FL, MEADS International's participating companies are MBDA in Italy, LFK in Germany and Lockheed Martin in the United States. Together, these companies have focused an international engineering team in Orlando to develop systems and technologies for the MEADS program, which is closely watched as a model for collaborative transatlantic development. The United States funds 58 percent of the MEADS program, and European partners Germany and Italy provide 25 percent and 17 percent respectively as partners in the NATO Medium Extended Air Defense System Management Organization (NAMEADSMO). Its program management agency, NAMEADSMA, is located in Huntsville, AL. In early 2015 Germany and Italy entered into discussion to continue Medium Extended Air Defense System (MEADS) cooperation without the US. Germany was evaluating its options to modernize their air and missile defense capability which is currently based on the U.S. Patriot system. Italy remains hopeful that Germany will choose MEADS as its future air and missile defense system, which would enable Italy to continue MEADS cooperation and perhaps even purchase and field its own MEADS-based air and missile defense capability. A continuation of the MEADS program would provide European countries with another viable alternative to US Patriot and European systems in this mission area. In a parallel development, Raytheon announced plans to upgrade the Patriot system to enable the company to more effectively compete for future US Army and foreign acquisition/upgrade efforts. Raytheon’s planned Patriot upgrade, which will include a Gallium Nitride-based Active Electronically Scanned Array (AESA) radar, would provide Patriot with 360-degree coverage (like MEADS). Media reporting indicated that the USG approved the upgraded radar for export offer in November 2014. Raytheon would like to leverage potential foreign sales of the new technology radar to help potential U.S. investment in this upgraded Patriot configuration, noting that twelve foreign countries have purchased various versions of the Patriot system. Poland, Germany, and the U.S. are all considering additional air and missile defense purchases or upgrades over the next few years and MEADS, Patriot, and (for Poland and Germany) Eurosam are all potential options. In June 2015 Germany announced plans to acquire the Medium Extended Air Defense System. The system would replace the military's current Patriot system by 2025. The military wants to purchase eight or 10 units, but the government had not announced its plan. The MEADS acquisition will cost around 4 billion euros.